Oil is once again driving volatility for Clean Energy Fuels Corp.
Shares of natural gas fuel company Clean Energy Fuels Corp (NASDAQ:CLNE) fell as much as 12.7% in trading Friday as oil prices continue to swing wildly on the market. Shares gained back some of their losses late in the day but were still down 8.7% at 3:25 p.m. EDT. Yesterday, fellow Fool Jason Hall highlighted how rising oil prices were helping push Clean Energy Fuels' shares higher. That trade reversed course today with WTI crude oil prices down 2% to $65.68 and Brent crude oil down 1.1% to $76.69 as I'm writing. The truth is that a stock that's risen as fast as Clean Energy Fuels is bound to pull back eventually. And shares are still trading at the same level as earlier this week. What's driven shares higher in the past month was Total's (NYSE:TOT) agreement to take a 25% stake in the company and provide promotions and financial support for ongoing investments. Shares are trading higher on optimism about Total's stake, but it's unknown if the support the oil giant can provide will lead to growing revenue or a net profit long-term. 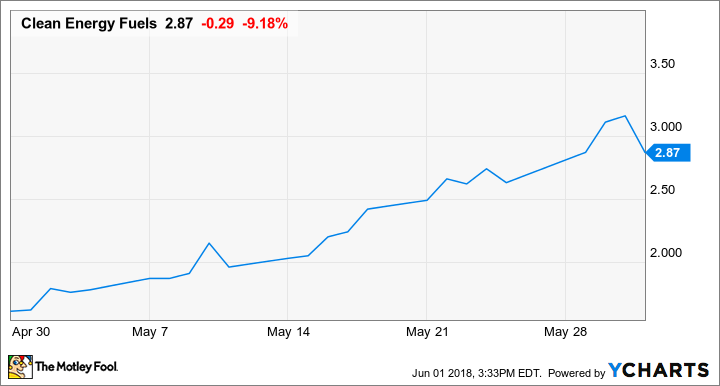 Since it's a fundamental improvement in the business that will ultimately drive the stock higher, the gains of the last month should be taken with a grain of salt until we see how operations change. For today, it's a pessimistic view that's pulling the stock lower.